Nine people were charged in connection with a voter fraud scheme in which homeless people in Los Angeles' Skid Row neighborhood were given cash and cigarettes in exchange for fraudulent signatures on ballot initiative petitions and voter registration forms, prosecutors said Tuesday. The Los Angeles County District Attorney's Office wouldn't identify a motive or details of the alleged scheme, but in May, NBC Los Angeles, in collaboration with NBC News, discovered that initial allegations connected to three of the nine suspects involved gathering signatures for four proposed ballot initiatives. "This is voter fraud, which we talk about, and we know it exists, but it isn't exactly something that patrol officers deal with," LAPD Detective Meghan Aguilar said in May. Five of the defendants were arraigned Tuesday and pleaded not guilty, prosecutors said. The initiatives promoted by the suspected fraudsters included statewide measures to reduce the number of felons considered non-violent and to increase income tax on millionaires and property tax on business owners. The case was still under investigation by the FBI and the Los Angeles Police Department. A number of suspects remained outstanding and subject to arrest warrants, LAPD Capt. Marc Reina said. The felony complaint against the nine includes allegations of circulating a petition with false names, voter fraud, registering a fictitious person, and registering a nonexistent person, prosecutors said. In a statement the District Attorney's office said suspects offered "money and cigarettes to homeless people on Skid Row in exchange for false and forged signatures on ballot petitions and voter registration forms." The case comes as national discourse over voter fraud heated up in November. President Trump, who has in the past alleged that "millions" of bogus votes were cast in the 2016 presidential election, recently said, without evidence, that there were "forged" ballots and "found" votes during the midterm election in Florida. The specter of voter fraud has led a movement in some conservative states to enact strict identification and address requirements, a move described by critics as voter disenfranchisement that disproportionately affects the poor and people of color. The counter argument has been that voter fraud is extremely rare. But the case in Los Angeles could upend that claim. "Democrats in California continue to pretend voter fraud doesn’t exist," Matt Fleming, spokesman for the Republican Party of California, said via email. "However, this incident highlights the need for more investigation of claims." Linda Paine, president and co-founder of Election Integrity Project California, said she was "pleased to see" authorities taking the matter seriously. But she expressed concern. "California's electoral process is based on the honor system," she said. "We know not everyone is honest. We are going to have our attorneys look into this as well." The press secretary for California Secretary of State Alex Padilla declined to comment, citing the ongoing investigation. The LAPD's Reina says its investigation started in spring after officers encountered long lines of people on Skid Row during off hours allegedly accepting cash, cigarettes and even snacks in exchange for bogus signatures. He said suspects, sitting at tables set up on sidewalks, had voter registration roll printouts and asked participants to illegally sign the names of what appeared to be legitimate voters. He said the scheme was busted by undercover officers posing as homeless people. Surveillance cameras also captured some of the alleged crimes, he said. It's not clear if the scheme, which prosecutors said applied to the 2016 and 2018 elections, had an impact on whether or not initiatives qualified. Investigators are "trying to follow where the money’s coming from, and who had knowledge of this practice," Reina said. Los Angeles County Registrar of Voters Dean Logan said previously that he believes any bogus signatures would have been weeded out by his office. Via email late Tuesday he added, "We are glad that the district attorney is actively ensuring the integrity of the election process by pursuing those who take part in fraudulent petition practices. Our office takes any activity that causes voters to lose faith in the process very seriously." Defendants were identified as Kirkland Kauzava Washington, 38; Harold Bennett, 53; Louis Thomas Wise, 36; Richard Howard, 62; Rose Makeda Sweeney, 42; Christopher Joseph Williams, 59; Jakara Fati Mardis, 35; Norman Hall, 61; and Nickey Demelvin Huntley, 44. City attorney's cases against Wise and Bennett were withdrawn in favor of the district attorney's prosecution, a spokesman for L.A. City Attorney Mike Feuer said. Earlier city prosecutions of suspects Howard and Christine Hooks ended in guilty pleas, probation and 60-day jail sentences, the spokesman said. 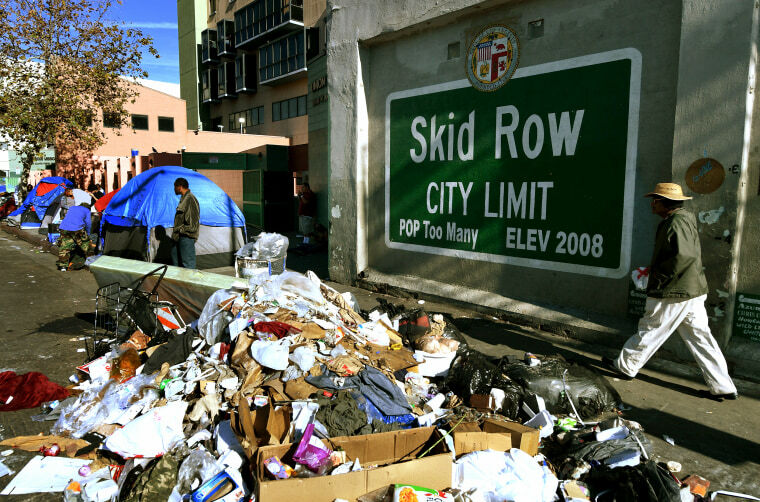 Those two were also ordered to stay away from a popular intersection in Skid Row. Another suspect, identified as Bernard Graham, had his case dismissed. Defendants face a maximum of four to six years behind bars, depending on the details of their case, prosecutors said.